I can distinctly remember such a fish design on a blue Chevy van (similar to the typical non-denominational "church bus") back in the 70's, owned by a heavily "charismatic" family who made it a point to attend the 7 PM folk Mass every Saturday evening. True story. Of both these tambourines, I offer you another image of something I used to see prancing up Massachusetts Avenue in Boston during my Berklee days - people with bald heads wearing white togas (who were NOT members of the Delta Tau Xi fraternity of Animal House fame, I might add!). 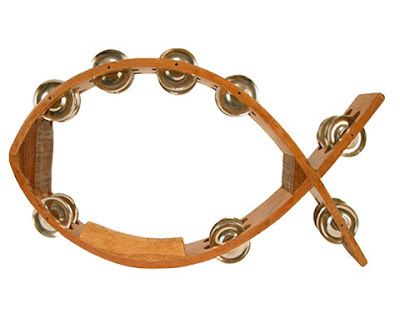 I wonder how long before the "Darwin" tambourine makes an appearance?